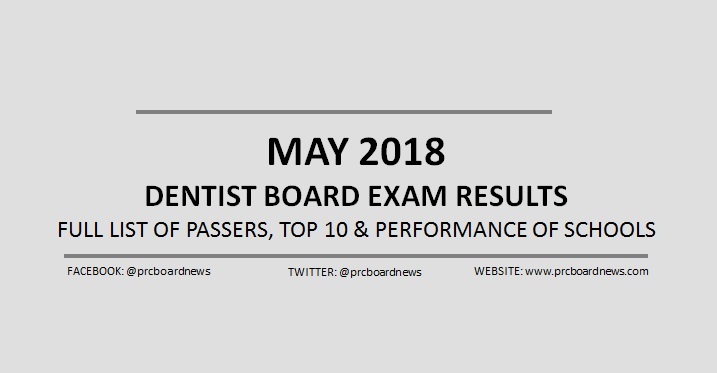 MANILA, Philippines – (Updated 6/5/2018) The Professional Regulation Commission (PRC) released results of May 2018 Dentist board exam (Written and Practical Phase) on Tuesday, June 5 or in two (2) working days after the last day of exam. The complete list of passers, top 10 (topnotchers), top performing schools and performance of schools are available on this page as announced online. UPDATE: 509 out of 1,117 (45.57%) passed the May 2018 Dentist Licensure Examination (Written Phase) and 509 out of 521 (97.70%) passed the Dentist Licensure Examination (Practical Phase). PRC administered the Dentist board exam in Manila on May 2, 3 and 4 (Written board exam) and on May 29, 30, 31 and June 1 (practical exam). The members of the Board of Dentistry are Dr. Roberto M. Tajonera, Officer-In-Charge; Dr. Rannier F. Reyes, Dr. Melinda L. Garcia, Dr. Gloria M. Bumanlag and Dr. Maria Jona D. Godoy, Members. From June 13 to June 22, 2018, registration for the issuance of Professional Identification Card (ID) and Certificate of Registration will be done on-line. Please go to www.prc.gov.ph and follow instructions for initial registration. According to PRC resolution No. 2017-1068, the May 2018 Dentist board exam results are out on Tuesday, June 5, 2018 or in two (2) working days after the last day of exam. In the same period last year, results were released in two working days. A total of 397 out of 857 passed the Written Phase and 394 out of 402 passed the Practical Phase. Alexa Eline Trinidad Tajud from Centro Escolar University (CEU)-Manila aced the board with 86.04%. Congratulation to all the dentists who passed the exam and are there to review the https://www.conferencepaper.net/speech-length-calculator/ so they can give their experience to the country and can convert their knowledge in the patients as well. The result is really impressive because this shows the complete responsibility taken by the students so more students will now visit page to learn what is in the term and how they can learn. There is the special area of the dentist with the help of which you can find the new exam list of the papers. You can also get the new announcements from this page with the http://www.psychologycapstoneproject.com/about-us/ and enjoy the best results from this site. Such a good post for the students getting a info about the dentist board exam. Each young lady and kid sitting tight in the midst of the present day and it is the surprising day of everybody life. Check this https://www.capstoneproject.net/best-capstone-project-ideas/ site and get more to manage your work. All data that you share in this article is so clear.